Nestled amongst the lush green hills of the Aravalli Range, the impressive Kumbhalgarh Fort stands out as a proud reminder of the past glory of this region. Located at a distance of 84 km away from Udaipur, this medieval fort city is a majestic sight to behold. This fort, which was built in the 15th century by Rana Kumbha, is the second most important fort in Rajasthan after the Chittorgarh Fort. A huge 36 km long wall encircles the Kumbhalgarh Fort that has seven majestic gates and ramparts one within the other. A number of monuments and temples lay scattered all over the Kumbhalgarh Fort and its surrounding areas. Besides, the fort also houses a number of palaces, some of which are in ruins. The best time to travel to Kumbhalgarh is from September to March. Some of the famous tourist attractions you can visit when you travel to Kumbhalgarh are listed below. The Badal Mahal or the Palace of the Clouds is one of the most beautiful palaces inside the Kumbhalgarh Fort. The highest of all the structures inside the fort, this picturesque palace offers a stunning view of the surrounding countryside and the fort as well. 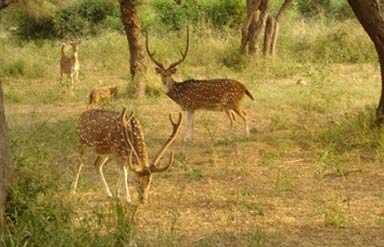 The Kumbhalgarh Wildlife Sanctuary that sprawls over an area of 586 sq km has a sizeable wildlife population consisting of panthers, sloth bears, four horned antelopes and scientifically bred crocodiles. Besides, the sanctuary also attracts a huge number of migratory birds during the winter. The park is a place you must not miss if you travel to Kumbhalgarh. The Mucchal Mahavir temple that is 5 km away from Ghanerao in the Kumbhalgarh Sanctuary is known for its statue of Lord Mahavira with a mustache. The gateway is decorated with statues of elephants, which give it a majestic look. A number of colorful Garasia tribal villages located nearby also draw many tourists to this site. » Road: There are many buses from Udaipur to Kumbhalgarh. Besides, there are roads that connect Kumbhalgarh to Ranakpur, which is 18 km away. » Rail: Udaipur is the nearest railway station, which is connected to cities like Delhi, Ahmedabad, Jaipur, Jodhpur and Ajmer. 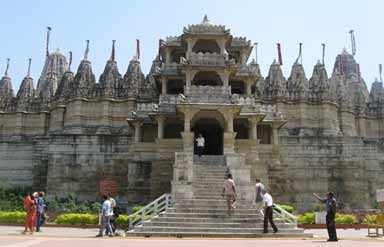 » Air: Udaipur is the nearest airport, which has flights to and from Delhi, Jaipur, Mumbai and Jodhpur. 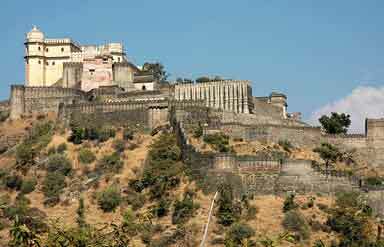 Caper Travel India provides tour packages to Kumbhalgarh. 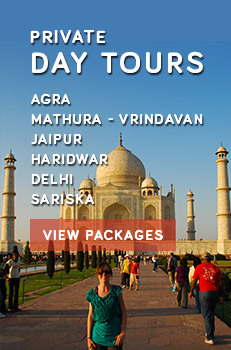 For more information or to book a tour, please enter your query in the form given.